In the imperial city, nothing escapes the attention of the empress’s spies. 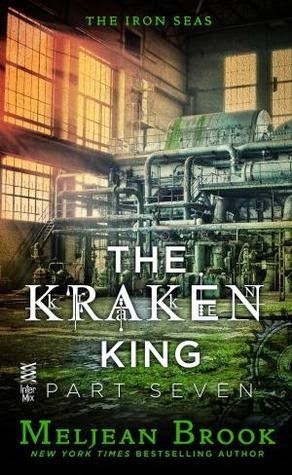 After a visit from an old friend rekindles her every fear, Zenobia must decide whether to trust Ariq with her heart—and the Kraken King must decide whether he can ever let her go. I'm assuming that if you're reading this, you've read the first 6 parts (but not necessarily this part, so no spoilers for that here). I mentioned in my post about the previous installment that it was a bit of a setting up one in terms of the action, which gave Ariq and Zenobia some quiet time to be together and work through some of the issues keeping them from being fully committed to each other (well, more keeping Zenobia from doing so, really). Part 7 starts in the same vein. Ariq is waiting to be received by the Empress, but at the same time, he worries that he hasn't heard anything from Krakentown for a while. Should he keep waiting or go back there to help (because if no news are coming out, it's surely for a reason)? And then we get action, and how! It was a hard section to read, as Ariq and Zenobia are really put through the wringer here. But even the most painful-to-read bits felt necessary, and action and romance came together there in the most perfect manner. I found these two characters admirable in previous episodes, but never more than here. I admired their courage and intelligence and cared even more deeply about them. The end is one that made me want to read the final part really badly. I wanted to continue more than I've wanted to continue at any part in the series, and yet, I still wouldn't call the ending a cliffhanger. It was a great place to stop. Still, I wouldn't bet on me waiting more than a couple of days before starting the final episode! I have been reading these as well, but getting them in ebook format from my library. I have decided I am not a serial book kind of reader. Not only do I want to read it all at once, in one sitting, waiting for my turn from the library has added another level of frustration. I find by the time I get the next part, I have to try and think back to where I left the main couple because I have read a number of other stories in between. I also usually do not have the previous section to refresh my memory as it's gone on to the next reader on the waitlist. I am enjoying the story very much but I agree 100% that parts of this installment were VERY hard to read. I'm interested to see how it all wraps up. I didn't have problems with the catching up, but I did have some issues with being able to just pick up the new installments when they came out. I've just written my review of the last one with a bit more detail, will post that soon.